Hi loves! 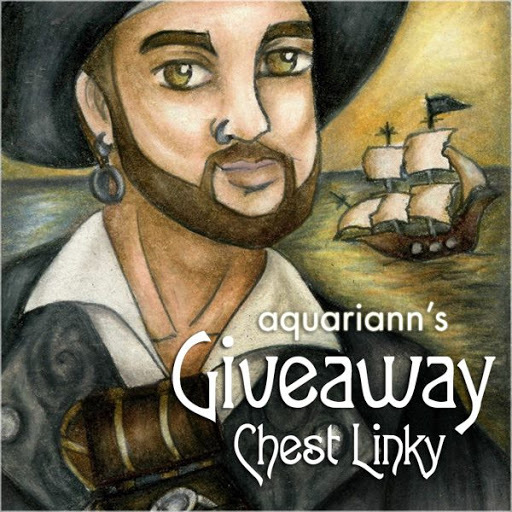 I’m Katie from Katie Crafts and I’m super excited to be writing Aquariann's Manicure Monday guest post today! Valentine’s Day is just around the corner. My outfit is already picked out (gray sweater dress with white hearts on it, red tights, red belt) but I still need a manicure. I tested out this design over the weekend and I think it may be the winner. 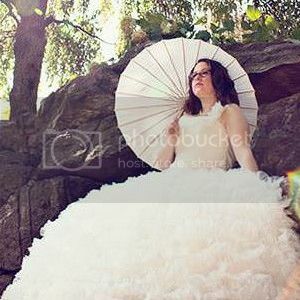 It’s super cute and pretty easy! The design itself is mega simple! 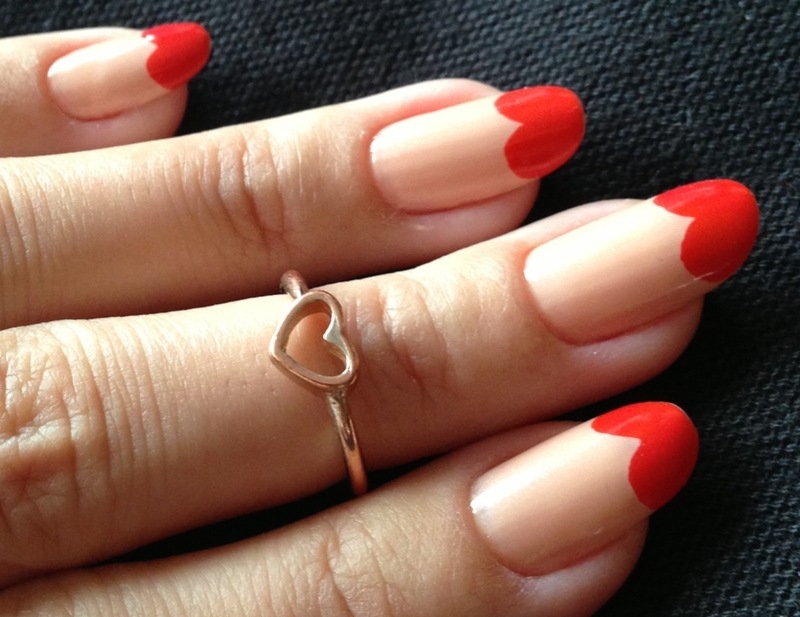 ♥ First, paint all your nails red, except your ring fingers which you’ll paint pink. 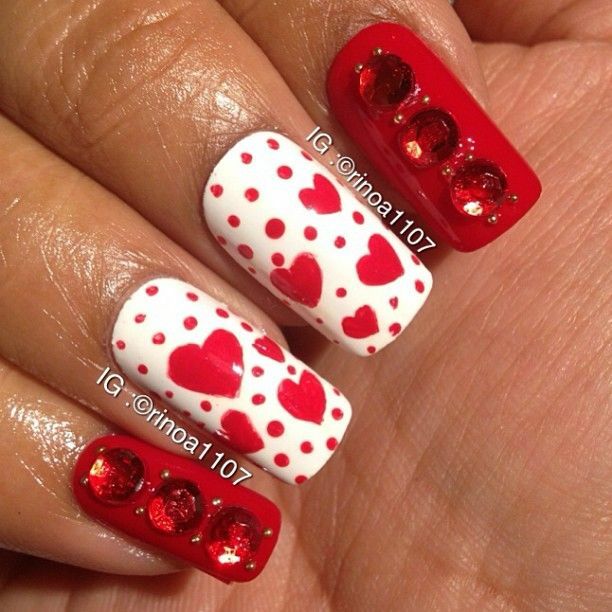 ♥ Once they are 110% dry, use the white polish to make little hearts on the red nails and let dry. 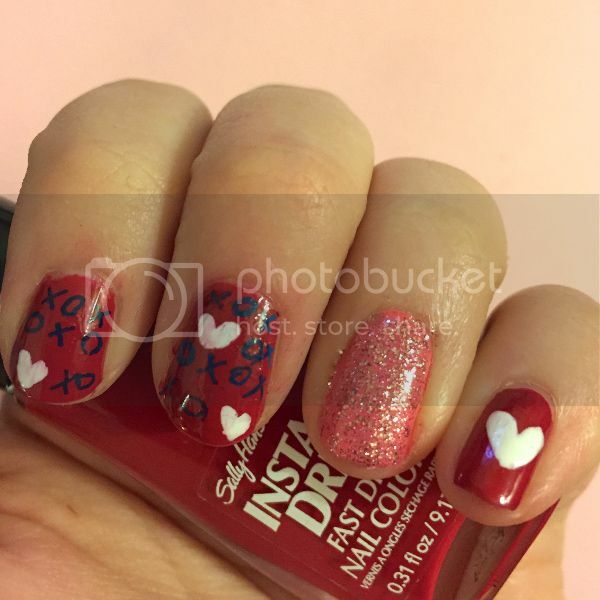 ♥ Use your nail art pen to draw X's and O's on your pointer and middle fingers. Draw "lo" and "ve" in cursive on your thumbs, so that when you put them together they spell "love"! ♥ On the pink nails, use a generous coat of your pink glitter polish to make your accent nail really pop. ♥ Seal each nail with a clear top coat and you’re good to go! Thanks for the lovely post and birthday wish, sweetheart! 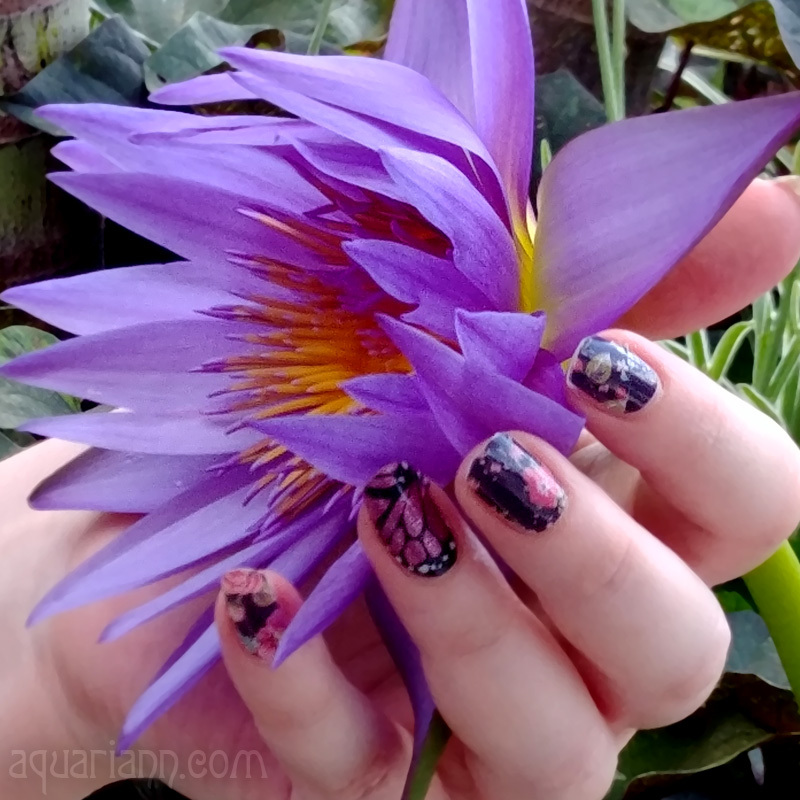 If anyone else would like to be a guest blogger for my Manicure Monday when I don't have new nails of my own to show off, please contact me using the form on my contact page for a free feature. 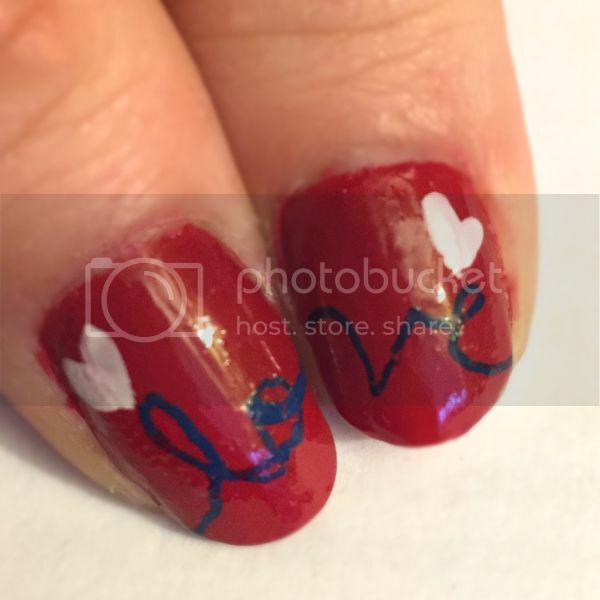 Or if you've done a Valentine's Day manicure in the past, comment with the link and I'll add it to my featured finds below. Pretty and festive. I like the way "Love" appears when the fingers are put together. Love the "love" spelled out Katie. So sweet! What nail art pens did you use? 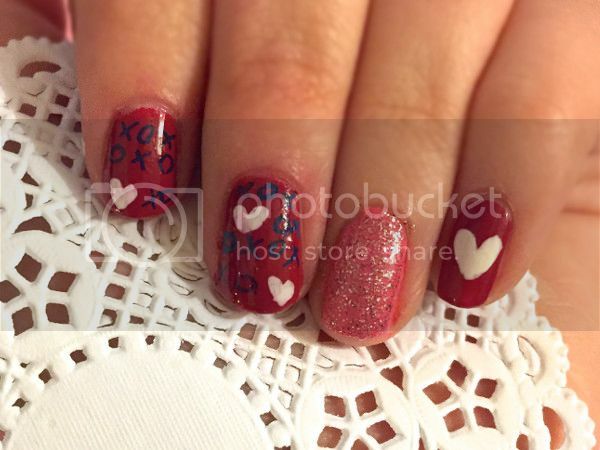 I love Katie's nails, especially the XOXO and the double nail LOVE. I've been trying to find good nail art pens. Any suggestions? How fun! I may get some help from my daughter and do this!